In stock -This product will ship today if ordered within the next 14 hours and 29 minutes. The mucilage of slippery elm, found in the inner bark, gives it the soothing effect for which it is known. Slippery Elm Bark - capsule: Vegetable hypromellose (HPMC). Take one capsule up to three times per day swallowed with water. 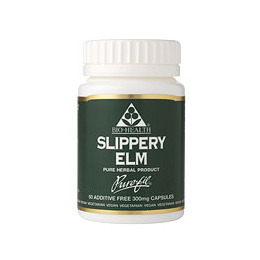 Below are reviews of Slippery Elm Bark - 60 x 300mg Vegicaps by bodykind customers. If you have tried this product we'd love to hear what you think so please leave a review. Great product for stomach problems, works especially well before bedtime, settles stomach and aids sleep. Very effective if you have diverticulitis. I have taken this to ease symptoms of IBS for 6 years now and i wouldn't try anything else.I have used other concoctions that have claimed to ease symptoms but they have not worked. If I forget to re-order then i soon realise it and promptly do so!! Great product for upset stomach, nausea, diarrhoea. Doesn't clog up the intestines. A gentle way of quickly easing symptoms. I have two Jack Russells and when they have an odd bout of vomiting, I open a capsule, mix with warm water and give some to them. Not a whole capsule full. (If they they are ill I obviously take them to the vet.) I have mentioned this to the vet and administer to my dogs with their approval. It has no nasties in, just pure organic and additive free. This product is essential to have in the medicine box. I've bought this item before and it is excellent for my indigestion . Great product and a great price. Really helps me with my gastritis and times of acid reflux. Can't be without it, much better than all the medications from the pharmacy and no nasty side effects either. This is a very good product made by Bio Health. I was advised to take this by my friend who is a Herbalist to help with my gastritis. I opened a couple of capsules and mixed it with warm water and drank first thing on an empty stomach. After a week I noticed a significant improvement. The texture is like wall paper paste when mixed with water ! But it feels very soothing once you drink it. I would definitely recommend this product if you have a stomach ulcer, gastritis, or any other digestive issues, it really does help.